The USBBT2EDR2 USB to Class 2 Bluetooth Adapter with EDR is a micro-sized adapter that adds Bluetooth capabilities to a computer through an available USB port, which enables you to connect to devices wirelessly, at ranges up to 10m (32ft) while consuming minimal power. Supporting the Bluetooth v2.1 specification along with Enhanced Data Rate (EDR), for transfer rates up to 3 Mbps, this adapter uses a small form factor design that makes it conveniently portable and unobtrusive when connected to a computer. What is a Bluetooth class and what is a Bluetooth profile? A device's maximum range can also depend on environmental factors, such as physical obstructions between the two Bluetooth devices. In order to achieve the maximum range defined by a Bluetooth class, both devices must support the same class. For example, if you wish to communicate at a 100m range, both Bluetooth devices will need to be class 1 devices. If one of the devices is class 2, both devices will operate at the range of class 2. Bluetooth profiles are additional protocols that that more clearly define the Bluetooth standard for very specific uses. Profiles define exactly how Bluetooth technology is used in specific situations. Some examples of Bluetooth profiles are Serial Port Profile (SPP), Human Interface Device (HID), Hands-Free Profile (HFP), and Headset Profile (HSP). How do I install this device in Windows 7 / 8? Download the latest drivers and software from the StarTech.com website at www.startech.com/Support. The part number and product ID are on the product packaging. In the list of extracted files, right-click the driver or software setup.exe file and select Run as Administrator. Follow the on-screen prompts to install the device drivers and software and restart the computer when prompted. Your computer will automatically complete the installation and your device should be ready to use. How do I install this device in Windows 8.1 / 10? The drivers for this device are native to your version of Windows. Connect your Bluetooth device to your computer and Windows will automatically install the drivers. If the drivers do not automatically install, or your device does not function as it should, you can install the latest drivers from StarTech.com. 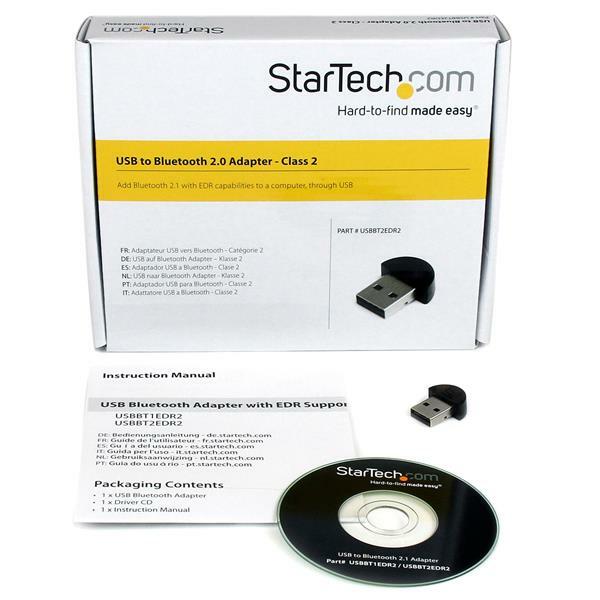 To do so, refer to the following FAQ: www.startech.com/faq/bluetooth-adapters-install-windows-78. My Bluetooth adapter is not working. What do I do? It’s important to make sure that the operating system that is being used with the Bluetooth adapter is supported by the device. You can be check which operating systems a device supports on the StarTech.com product page, under the Technical Specifications tab for the device. The most up-to-date drivers and software should be used with the Bluetooth adapter. These are found on the StarTech.com website on the product page, under the Support tab. It is important to be aware of the range of the Bluetooth adapter, and the distance to the Bluetooth device that pairing is being attempted with. The range of the adapter can also be viewed under the Technical Specifications tab for the device. If you encounter issues pairing with a Bluetooth device, another device should be tested (if possible). If the adapter is not functional in the first USB port on the first computer system that is used, additional ports and an additional computer system should be tried. If you have a second Bluetooth adapter, you should test with it as well.